Meade Potato Company has won the Fruit and Vegetable Agribusiness of the Year at the Agribusiness Awards held at the Ballsbridge Hotel in Dublin on Thursday, November 9. In presenting the award the independent judging panel from the academic, semi-state, local government and private sectors commended the company on their family farm ethos and their sustainability. This is their third year to win this accolade. Other award winners on the night included Carbery Food Ingredients, Clonakilty Food Co., Manor Farm, Herdwatch, IFAC Accountants and Dawn Meats. 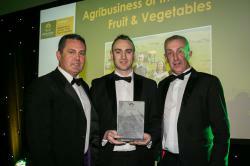 Other agri-food award winners on the night included Clonakilty Food Co., Manor Farm and Dawn Meats. Meade Potato Company are growers, packers and distributors that employ 240 people from their farm in Lobinstown, County Meath. The family business was established in 1982 and specialises in growing potatoes and carrots but also work with a team of growers that enable them to offer the full range of fresh produce to retailers ncountrywide. Their recent expansion into Prepared Foods has seen them enter the Foodservice and Catering markets with their freshly peeled potatoes. They were also recently commended at the Irish Quality Food and Drink Awards for their potatoes, the only potatoes to receive a commendation on the night. Accepting the Fruit and Vegetables Agribusiness of the Year Award from Emydex Technology CEO David McMahon (left) are Patrick Meade (centre) and Robert Devlin (right) of Meade Potato Company. The event was held at the Ballsbridge Hotel on Nov. 9 and attracted companies from across all agribusiness sectors. “To win this award is a credit to our team of growers, our farm manager and our staff. They put in the hard work from the field right through until our produce is dispatched to our customers,” said Patrick Meade, Commercial Director of Meade Potato Co. on the night. 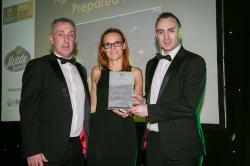 Accepting the Prepared Foods Agribusiness of the Year Award from Visum Co-Founder & COO Oonagh McNerney (centre) are Robert Devlin (left) and Patrick Meade (right) of Meade Potato Company. The event was held at the Ballsbridge Hotel on Nov. 9 and attracted companies from across all agribusiness sectors. “Our Prepared Foods business has been successful on all fronts; we are filling a real gap in the market for quality peeled potatoes for the foodservice and catering markets while increasing our sustainability by deriving new products that add value,” explains Patrick Meade, Commercial Director of Meade Potato Co.